Enter a giant obelisk and help stabilize its core. Spellscar — Stabilize the Mage's staff before it explodes. A giant object fell from the heavens when the Mage constellation disappeared. Sara Benele is examining the object, which she calls the "Mage's Staff." She believes the staff is unstable and needs my help to fix it. Bring fire, frost and storm infusions to Sara Benele. Enter the portal to Mage's Staff. When you discover Spellscar for the first time, Sara Benele runs up to you. Her sister, Gabrielle, told her you aren't afraid of danger. Sara wants you to stop the large staff, which the locals call the Mage's Staff, from emitting magical energy. If you don't, it will explode. The staff fell from the sky just before the constellations vanished, and it is drawing every "magic-addicted sorcerer and atronach in the region" to it. In order to stop it, you will need to find a way into its core. This will require a large amount of magical energy. You need to bring three elemental infusions to Sara. Kill the fiends and quickly harvest the infusions (flame, ice and storm). 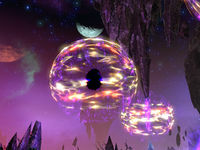 To collect an infusion, you need to kill enemies near the large black shards, then activate the shard. The shards have different colors to reflect the different element you receive from activating it. The flame infusions are south of Spellscar, the storm infusions are north and slightly east, and the ice infusions are to the west. Once you have activated all three infusions, head to the quest marker near the Spellscar icon on the map. Sara Benele will only spawn here when you have all three infusions. You will see a focus crystal for each of the three infusions. You will have to activate each one, followed by the staff infusion. Sara uses a spell on the staff, opening a portal to its core. You need to make your way to the core and stop it from overloading. However, some atronachs and spellfiends have gotten inside the staff. Defeat them, and head toward the core. Once you get close enough, Sara will start to disable the core. You need to "protect" her as she does this, so defeat Magdra Tigun, a flame atronach, at the first level; Nomeg Nulu, a frost atronach; and Zymel Ozata, a storm atronach, at the final level. It is necessary to defeat all three of these bosses in sequence without dying to complete the quest. If you are defeated while fighting Nomeg Nulu or Zymel Ozata, you will have to start over again at the fight with Magdra Tigun. Take the portal back to Spellscar, and talk to Sara. It is recommended that this quest be done with a group of two to four, though it can be done solo with some difficulty. 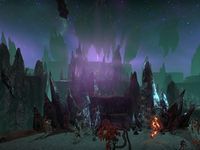 Prior to Update 12, a group of four was required; to gain entry to the Mage's Staff, three players had to carry an infusion while the fourth had to channel the Staff. Sara needs the staff's magicka to power a spell to gain access to its core. We should gather three types of infusions from staff shards scattered in the Spellscar. Only one person can hold each type of infusion. We have given Sara the three infusions she needs. She can now open the staff. Sara opened a portal to the core of the staff. I should follow her inside and help her stabilize it. I entered the core of the staff with Sara, and am now in a magical vortex populated by floating staff shards. We should make our way to the core on the far side of the vortex. Sara needs to disconnect the crystals from the core so she can cast a barrier spell to contain its growth. However, I need to protect her from the core's magical feedback as she disconnects the crystals. Finishes quest Sara cast a barrier spell on the core to stabilize it. I should take her portal out of the staff and meet her outside.